Tow Ball Weight: 165 Kgs. 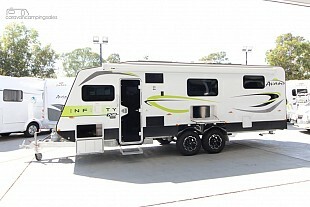 THE ASPIRE 617 CARAVAN THAT WILL DO IT ALL ! REDUCE FROM $68,600 DOWN TO $61,950! - THULE WIND OUT AWNING. - GAS AND ELECTRIC HOT WATER SERVICE. - DOUBLE BUNKS IN THE REAR. - 185L 2 DOOR FRIDGE AND FREEZER. - ADVENTURE PACK WITH ALKO COIL SUSPENSION.